The mother of three children who died while crossing a busy street to get to their school bus had complained to her kids' school district about the hazard years before her children were tragically killed, her friend and neighbor tells NBC 5's Natalie Martinez. The mother of three children who died while crossing a busy street to get to their school bus had complained to her kids' school district about the hazard years before her children were tragically killed, her friend and neighbor told NBC 5. 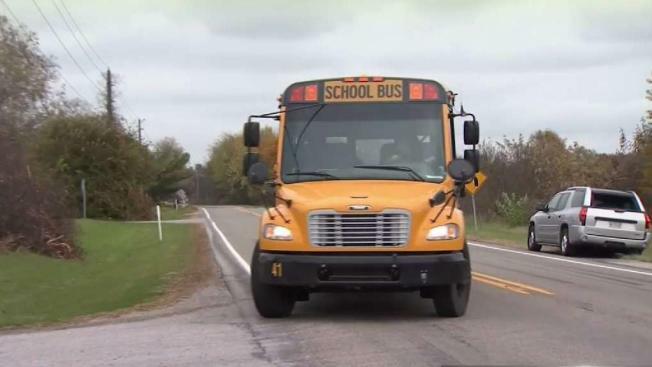 Tippecanoe Valley School Corporation said in a statement that beginning Thursday, the bus stop on State Road 25 will be relocated into Meiser Park following the death of twin 6-year-old boys and their 9-year-old sister. In addition, school Superintendent Blaine Conley said a transportation safety review committee will examine all bus stop locations "to ensure our children are transported safely." But some residents say the change came too late. Heather Crispen said her family friend, the mother of the children fatally struck Tuesday while boarding their school bus, had fought for years with their school district to have the bus pull into the trailer park where they lived. Instead, the children were forced to cross a busy stretch of road. "They told us because they were not a special needs child, they were not going to pull into the park," Crispen said, noting that her own children were just steps ahead of the four children hit by a pickup truck on North State Road 25 in Rochester, Indiana. "It could have been prevented a long time ago... shouldn't have to come to her losing half her family for the school to do something about it." Authorities said the children were at their bus stop, crossing the street with the stop-arm on the bus out when a vehicle hit the kids. Nine-year-old Alivia Stahl and 6-year-old twins Xavier and Mason Ingle were killed. "The parents are destroyed. They're never going to see their kids again," said Elgin Ingle, the uncle of the three children killed. "The surviving daughter has no siblings anymore and mother had to run to the aid of children as they lay there lifeless on the concrete. They're doing as bad as you'd expect a parent to be doing." Eleven-year-old Maverick Lowe was also injured in the crash and airlifted to a hospital in Fort Wayne. It was a crash state police said was unlike any other they'd seen. A 24-year-old woman has been charged in the deaths of the three children. Alyssa Shepherd was charged with three counts of reckless homicide and one count of passing a school bus and resulting in bodily injury. She was reportedly cooperative with police, picked up at her place of employment and later released on $15,000 bond. It was unclear if she had an attorney. "I just can't imagine the pain that family is going through," Sgt. Tony Slocum with the Indiana State Police's Peru District. "The one thing I'd like to tell people - we all have a responsibility to share the road in a safe manner. I don't know why this crash - why this person did not see the stop arm extended but we all need to pay a little more attention because it's all our responsibility to make sure our children get to and from school safely." The accident happened near Rochester, about 92 miles southeast of downtown Chicago. A GoFundMe campaign has been started to help the family of the children killed.